On “MIC:CHECK (occupy)” at Sideshow gallery, Brooklyn; “Gabriele Evertz: Rapture” at Minus Space, Brooklyn; “Lori Ellison” at McKenzie Fine Art, New York & “Halsey Hathaway and Gary Petersen: New Paintings” and “Paintings by Rob de Oude” at Storefront Bushwick, Brooklyn. Unlike many of our other toxic assets, Hirst somehow avoided the downgrade of 2008. He has positioned himself as a bubble about a bubble, madness about madness, as much of a statement on popular delusion as a product of it. He designs his artwork to appear valueless—blown-up baubles, useless pills, the trinkets of a carnival midway writ large—then sits back as his prices plump up against all reason. What matters is the way we respond to them. Amplified through a feedback loop of supposed meaning, popular reaction builds into a deafening noise that Hirst and his supporters point to as evidence of his ability to resonate with mass hysteria. Brilliant, right? Except for one thing: I always thought Hirst was worthless, and I’ve yet to meet anyone who thought otherwise. So where is the madness? It doesn’t exist. It never did. The Hirst bubble was never the product of mass delusion. It was something far less interesting—a fake bubble puffed up and maintained by a syndicate of gallerists, museum professors, PR flacks, art gossip reporters, and moneyed collectors. The only madness surrounding Hirst is the hype they generate for him and our exasperation at the inanity of the spectacle. The Gagosian shows are merely groundwork for Hirst’s retrospective at Tate Modern this spring. The Tate will then promote future sales at Gagosian. And so on. That’s the insidious thing about the Hirst bubble. Unlike a real bubble, we never want to buy in, yet somehow we end up holding the goods anyway, in this case through our public institutions. We did not willingly inflate anything. Instead, the Hirst bubble blows up by knocking the air out of the rest of us. It comes down to a battle over air rights. So many artists are making vital work today. 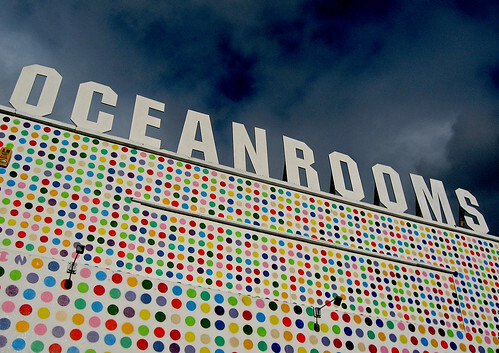 They could resonate the spots off Hirst. They just need their air back. Art abhors a vacuum. It needs atmosphere to bounce its energy around. That’s why artists, writers, and videographers are slowly building their own infrastructure to support an alternative ecosystem for serious art. They are finding ways to nurture the art they value most. And little would be possible without alternative galleries to exhibit this work. I have written many times in this space about the galleries in Bushwick, Brooklyn. Yet before Bushwick was even on the map, there was Sideshow Gallery, founded in 1999 by Richard Timperio in the nearby neighborhood of Williamsburg. The artists here are tied together in more ways than one. This is not some museum curator’s idea of what’s hip this season but rather an organic network that has long been showing and working together, in some cases for over half a century. These artists do not exhibit here expecting to sell. They give their work over to Sideshow to demonstrate their affinity with the alternative scene. On opening night, the line goes around the block, even without advertising or coverage in the mainstream media. I have never seen a larger gathering of work by great contemporary artists, with many I have previously covered in this column, including Lori Ellison, Tom Evans, Gabriele Evertz, Bruce Gagnier, Dana Gordon, Ronnie Landfield, Loren Munk, Carolanna Parlato, Peter Reginato, Paul Resika, Lars Swan, Kim Uchiyama, Don Voisine, Louisa Waber, John Walker, and Thornton Willis. Then there are artists whom I know better in their other roles—as the critic Mario Naves, the gallery owner Janet Kurnatowski (who, a few blocks away, is now exhibiting her own annual exhibition of works on paper), and Lauren Bakoian, the director of Lori Bookstein Fine Arts. With its crowded bodies and crowded walls, Sideshow offers a must-see exhibition that is a challenge to view. It is an annual conference of alternative art as well as a card catalogue of artists to follow throughout the year. Of particular note this year is the small panel by Evertz, an example of this colorist’s investigation into gray that was the subject of a breathtaking show at Minus Space.2 Landfield’s small canvas reveals the lyrical abstractionist at his finest. Uchiyama’s watercolor on paper was a spare standout. Gordon is a Sideshow regular whose Orphic investigations into shape and color have led him to create some of the best paintings of his career. More of his work will be on display this month at the Triangle Arts Association in a group exhibition called “What Only Paint Can Do,” curated by our own Karen Wilkin. McKenzie has matched Ellison’s recent geometric and biomorphic pen drawings and gouaches on wood with a series of arabesques from a decade ago, some painted in glitter glue. The comparison is interesting. While remaining idiosyncratic, Ellison has clearly distilled out the cuteness over the years, refining her geometry and color sense to create the crackling abstractions we see today. While her works are nothing if not obsessive, they have evolved in a way that speaks to the seriousness of her studio practice and explains how she now comes to have our undivided attention. Bontecou works at the intersection of man, nature, and machine. Her neo-Gothic, steampunk, post-apocalyptic aesthetic owes something to her upbringing: her father invented the first aluminum canoe; her mother wired submarine transmitters. But even here she resists easy labeling, seeking to occupy “all freedom in every sense.” At FreedmanArt, creations are more undersea than overhead, with delicate ocean crafts suspended from the ceiling and odd plant- and mollusk-like creatures peering up from sandbox dioramas, all paired with drawings of waves, flowers, and eyes. 1 “MIC:CHECK (occupy)” opened at Sideshow gallery, Brooklyn, on January 7 and remains on view through February 26, 2012. 3 “Lori Ellison” opened at McKenzie Fine Art, New York, on January 5 and remains on view through February 11, 2012. 4 “Halsey Hathaway and Gary Petersen: New Paintings” and “Paintings by Rob de Oude” opened at Storefront Bushwick, Brooklyn, on January 1 and remains on view through February 5, 2012. 5 “Lee Bontecou: Recent Work: Sculpture and Drawing” opened at FreedmanArt, New York, on October 27, 2011 and remains on view through February 11, 2012.